The way City Link workers (2,356 delivery drivers and 371 admin staff) heard that their jobs had gone speaks volumes for the precarious situation of workers today. For Jon Moulton, a ‘private equity investor’ who has made around £100m over the past three decades, mainly from buying up bankrupt companies and attempting to ‘turn them around’, the collapse of City Link is just one venture that didn’t come off ­– all part of gambling excitement; you win some, you lose some. Even when the gamble doesn’t pay the likes of Moulton can never lose. His means of existence are not at stake. On the contrary, it’s well-publicised that Better Capital, the firm he set up in 2009, stands to gain the first £20million of any capital recovered in the bankruptcy procedures. Not bad going for a company he bought for £1 from Rentokil in 2013. Moulton argues that this is simply getting some of the money back he has put in ­– not him in person – Better Capital is a genuine limited liability company and he doesn’t stand to lose anything personally. The £40million he says he originally put into the company was in the form of a ‘secured loan’. No accident of course. It means Better Capital is classed as a ‘secured creditor’ and ranks ahead of employees when proceeds from the liquidation are distributed. Better Capital stands to get the first £20million of any recovered assets. In fact it’s difficult to find anywhere near £20million worth of assets, never mind £40million. The latest news is that DX Group a rival logistics firm headed by a former managing director of City Link, Petar Cvetkovic, has “agreed to acquire parcel scanning equipment, cages that are used to transport parcels within warehouses and “certain intellectual property” for £1.125m cash” [Financial Times 6.1.15] As for the warehouses themselves, they were sold off long ago and the depots today are largely held on a lease. Nowadays ‘turning round a business’ doesn’t necessarily mean investing in more efficient capital equipment. The standard method of the cut and run private equity company is to ‘reduce costs’ – the cost of labour power, that is. The first thing Better Capital did to ‘turn round’ City Link was change the contracts of the workforce so that drivers were now paid on a parcel by parcel basis and the onus was on them to drive round as fast they could and make as many drops as possible in a day. That wasn’t enough of course. The next cost-cutting exercise was to oblige around 1,000 of the drivers to become self-employed, or in today’s Newspeak become “Service Delivery Partners” (City Link website). It’s a familiar bosses’ ploy to reduce ‘overheads’. While the worker has to provide his/her own national insurance, the employer is exempt from holiday and sick pay, and any commitment to redundancy payment. In the case of City Link the drivers also had either to provide their own van (which had to be painted in the firm’s colours) or lease one from the firm (at £6,240 per year, plus a deposit, to be paid off monthly) and of course pay for their own fuel and insurance. On top of that the uniform cost £88. The RMT union points out that estimates on the company’s website that a driver could earn £43,000 in a year are based on the assumption that “drivers worked every week of the year and made 103 deliveries per day at a rate of £1.65 per drop. But a footnote on the site warned that City Link had no obligation to ‘provide a minimum amount of work, or any work’ ”. (Financial Times, 3-4 January 1915) Clearly the aim was to eventually use only subcontracted, self-employed drivers but the company went bust anyway so the workers whose solidarity was undermined by different terms of employment are just as divided as they face the loss of their livelihoods. Those who were self-employed are not entitled to any redundancy. The others, whatever their ‘rights’ are likely never to receive any redundancy pay-out from the insolvency procedures. Now many of them will be competing to sign up with DX Group which generously announced “We are also doing all we can to provide opportunities for former City Link employees”: an opportunity to be self-employed, that is. In this context it is admirable that members of both groups of workers have joined the pickets and protests at various City Link depots even if they are RMT-organised. However, only a minority of workers are involved and the sad truth is that isolated protests of workers on the back foot are unlikely to develop into anything more than an occasion to let off steam. In any case the RMT’s framework of targeting subcontracting employers is not enough, it misses the point. The target we all must eventually face up to is crisis-driven capitalism. Capitalism which, in whatever shape or form it takes today is intent on driving down wages. Making workers pay for their own ‘overheads’ and calling them self-employed is a convenient way of doing this. Of the 1.1 million jobs created in the UK since 2008, 732,000 are classed as self-employed. Far from a sign of a prosperous new generation of capitalist ‘self-starters’ the rise of self-employment is part of today’s low-wage economy: an economy where it is estimated real pay will still be lower in 2019 than it was in 2007. The cut-throat world of retail delivery is emblematic of the wider economy. 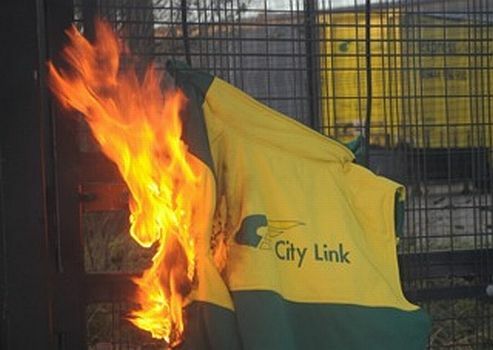 The picture above the article shows City Link workers in Rotherham setting fire to their uniforms. I absolutely agree that the target we must eventually face up to is crisis-driven capitalism, but it can't just be viewed from 'above'. You can come out of a job from years of stress, work your socks off in another one, get 'made redundant', go to ACAS, get another with complicated demands on you, then go up and down ladders in waterlogged warehouse self-employed, then try paying off divorce settlement part-time ! A young bricklayer might be 'on the books' as an apprentice but find that he doesn't get enough actual training on the trowel', so he reckons to do better self-employed. Then he can't get a mortgage until he's done tax returns for at least two years and needs an accountant. The point I am trying to make is that there are acute problems in any interim between trying to persuade workers that the prospect of socialist revolution ought to be more necessary than the imagined prospects of eventually doing better or just getting by under the chaotic status quo. How many workers are going to look at marxist websites regularly, if at all? What might persuade them to start doing so? Maybe more and better leaflets ? When I worked in a promotions department the experienced manager advised that it is more effective to use plenty of low-cost ones. Interesting post T 34. But I suspect things have still got to get worse before we wake up. Some event has to take place that makes even your young bricklayer realise that we can't go on anymore as we were. That things won't get better. And what does "better" mean under this system anyway? A new trowel? A more expensive accountant? Better leaflets? If it was the 1st. World War as a desperately shocking event that made many workers realise that change was necessary, and that they alone could do it, across borders, the international working class, then what might happen now that could produce a sudden snapping of the bourgeois mental grip and bring about the dawn once again of class consciousness? Well of course I don't know. But surely it could happen? It must happen or all is lost. What will finally snap the young bricklayer out of his mistaken idea that things might still get better, that being a success in capitalism's terms is actually worthwhile, that there is no alternative to capitalism, that Russia was communist and so on. And when will he suddenly realise that we live under the bourgeoisie's dictatorship, and that their much vaunted democracy is phony crap and their capitalist system produces world wide wars and perpetuates the enslavement of wage labour? He can realise this and will do so when the circumstances provoke him. But how does it start? Answers on a post card please! Or on this very forum. Thanks, Charlie, for your response. I'm not sure your anticipations are as you expect. If things suddenly get drastically worse, there will probably be calls for a restoration of 'order'. Success under capitalism is generally seen as getting more of the currently necessary money, preferably faster than the steadily rising prices, for instance in the costs of homes, whether rented or mortgaged. That is the reality of today. As I suggested previously, the challenge is to portray socialism as an actual realistic necessary forthcoming possibility, thus more than a dream escape from a nightmare.